Weighty Matters: What's Today's Dietitian's definition of a, "healthy, better for you" food? What's Today's Dietitian's definition of a, "healthy, better for you" food? Too bad the picture's going to give this one away, I'd have loved to have had you guess. You might have guessed, fresh fruit, fresh vegetables, quality grains - but you'd have been very, very wrong. According to an article I read in Today's Dietitian magazine about "Healthful Vending in Today's School", the correct answer is apparently "popped" potato chips. 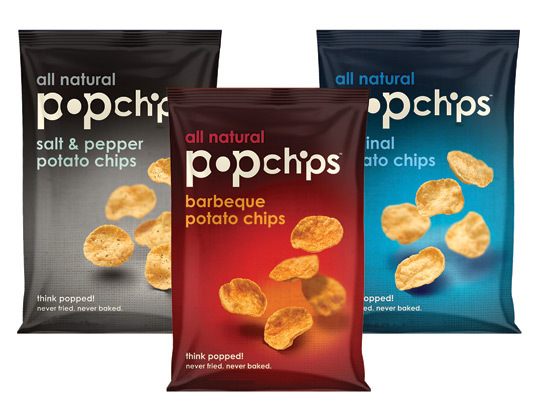 So what's so "healthy" and "better for you" about Popchips? Well best I can gather is that they have 20% fewer calories than potato chips, but the same amount of sodium, and no more in the way of fibre or protein. You know what they also have due to the inanity of articles like the one in Today's Dietitian? A Health Halo that lets school boards pat themselves on the back about what a great job they're doing with their students and misinforms students about a product that at best, with a huge stretch, could be described as every so slightly less bad than potato chips. If this product truly strikes today's dietitians as "healthy", or, "better for you", then I'd say there's something terribly wrong with today's dietitians. "a powerful marketing vehicle for nutrition products and services. Our partners let our reputation work for them, and those partnerships have helped thousands of companies enlighten and educate a responsive audience of more than 110,000 RDs and nutrition professionals about their products, brands, and companies." All the nutritional spin that's fit to print.